"""Help Gina-Marie time her contractions.""" 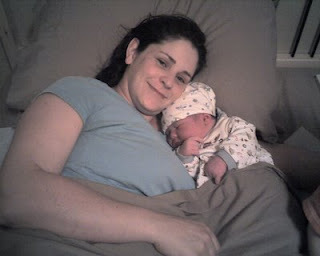 Jocylenn Grace Behrens was born at home on 5/16/2009 at 11:47PM after 6.5 hours of labor. She weighed 10lbs 8oz. Both her and my wife are recovering nicely, and we're all grateful for their good health. Congratulations to you and the lady of the house. Many congratulations. Glad mother and daughter are both doing well. Congratulations! How many children is that now? May God richly bless you and your family for your generosity to the service of life! The midwife corrected me. It turns out that she didn't grab the baby by the head. She slipped in her hand and hooked a finger under the baby's armpit. I was wondering how she could yank so hard without hurting the baby's neck ;) I guess those are the tricks you learn after you've delivered a few thousand kids! > Congratulations! How many children is that now? > May God richly bless you and your family for your generosity to the service of life! Congrats dude! Heather and I are very happy for you guys. And holy crap, that's a big kid. A Behrens for sure. Can't wait to meet her. JJ, congratulations from Ukraine! Wish you God's Bless and good health for baby, mother and whole family. I wanted to thank you for the program you posted. I have added to it a little for my use and wanted to show you what I have done with it... This is being run from ipython console with the -pylab option. Hahahaha!!! Congrats!!! Did you do this while she was in labor?